Product prices and availability are accurate as of 2019-04-24 09:14:20 EDT and are subject to change. Any price and availability information displayed on http://www.amazon.com/ at the time of purchase will apply to the purchase of this product. 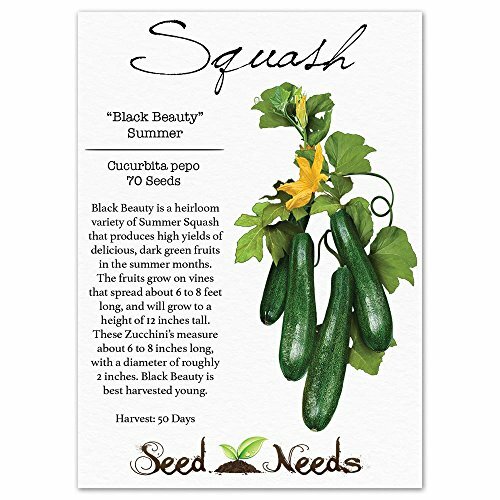 Grow a garden filled with Black Beauty Zucchini Squash, from freshly harvested Cucurbita pepo seeds. 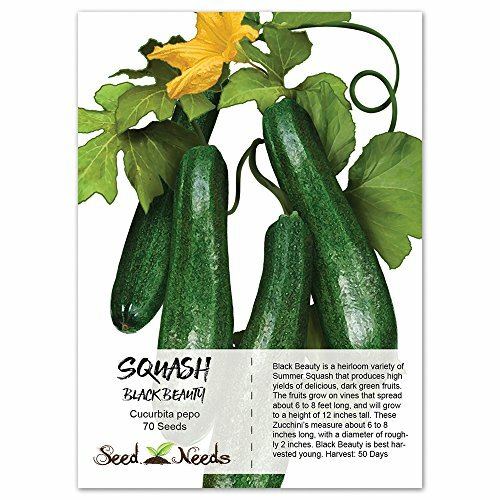 Black Beauty Zucchini is an heirloom Summer Squash that produces 6 to 8 inch long fruits. The outer skin is a dark green almost black color, with a creamy white inner flesh. Each plant grows to a mature height of roughly 12 to 24 inches tall, dsiplaying a bush like growth habit. 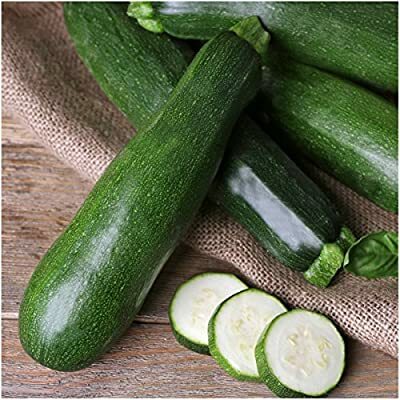 Black Beauty Zucchini will yield a fair amount of fruits, and can be harvested in roughly 50 days. Squash plants, like pumpkins, are grown as annual plants. Annuals will grow quickly, producing vines, leaves and fruits through the warm months of summer. After harvesting the Squash from it's vines, the plants will wilt soon after, with the cooler temperatures of late Autumn. Squash plants can be regrown the following season if you manage to save some of the seeds within the Squash itself. 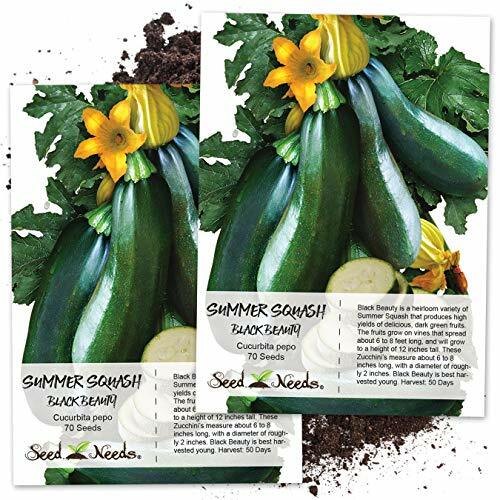 Quality Summer Squash seeds packaged by Seed Needs. Intended for the current and the following growing season. Packets are 3.25" wide by 4.50" tall and come with a full colored illustration on the front side, as well as detailed sowing instructions on the reverse. 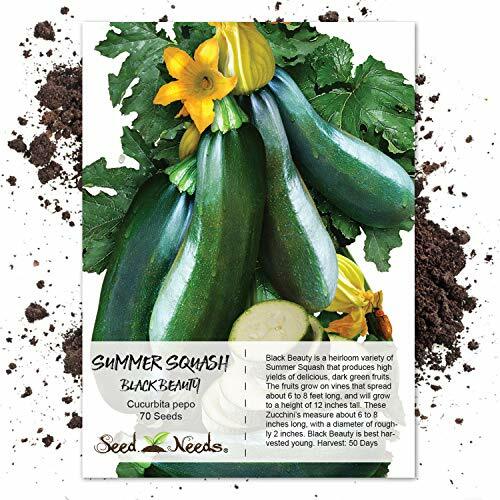 Black Beauty Zucchini is an heirloom Summer Squash that produces 6 to 8 inch long fruits. The outer skin is a dark green almost black color, with a creamy white inner flesh. Each plant grows to a mature height of roughly 12 to 24 inches tall, dsiplaying a bush like growth habit. Black Beauty Zucchini will yield a fair amount of fruits, and can be harvested in roughly 50 days. Squash plants, like pumpkins, are grown as annual plants. Annuals will grow quickly, producing vines, leaves and fruits through the warm months of summer. 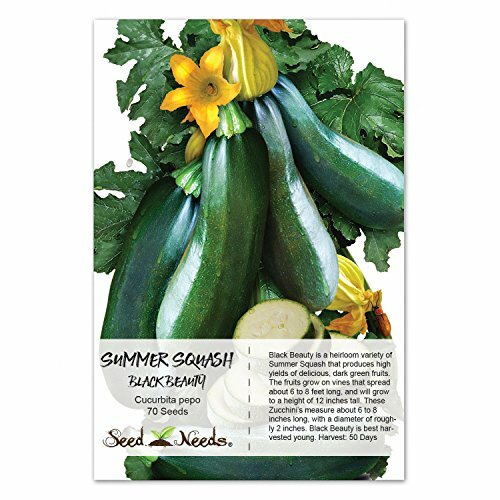 All Summer Squash seeds sold by Seed Needs are Non-GMO based seed products and are intended for the current & the following growing season. All seeds are produced from open pollinated plants, stored in a temperature controlled facility and constantly moved out due to popularity.